I have adjusted my furniture a bit (once again). I know big surprise! I got a bun on to move my striped chest behind my sofa to be like sofa table. It's a tad higher but the back is finished and it happens to be the same height as the back cushions of the sofa so it works! While moving things around I suddenly saw another possibility and that was to move the game table to the end of the sofa. I couldn't be happier with it. I've been trying to sneak in a way to have some blue in the room and my big picture on the wall has a faint amount of blue in the sky so that was my "license" to allow me to add some more! I ran across this lidded jar at a furniture store and I felt it had the right kind of coloring that I could add it in easily. A little more blue from some books helped too! I wanted to find a new way to use my big wire bowl from Pier 1, and I saw these blue candles and felt they were close in color to the lidded jar so I thought I'd give it a try. I may swap out a blue candle for a green candle to further tie the room colors into this arrangement. 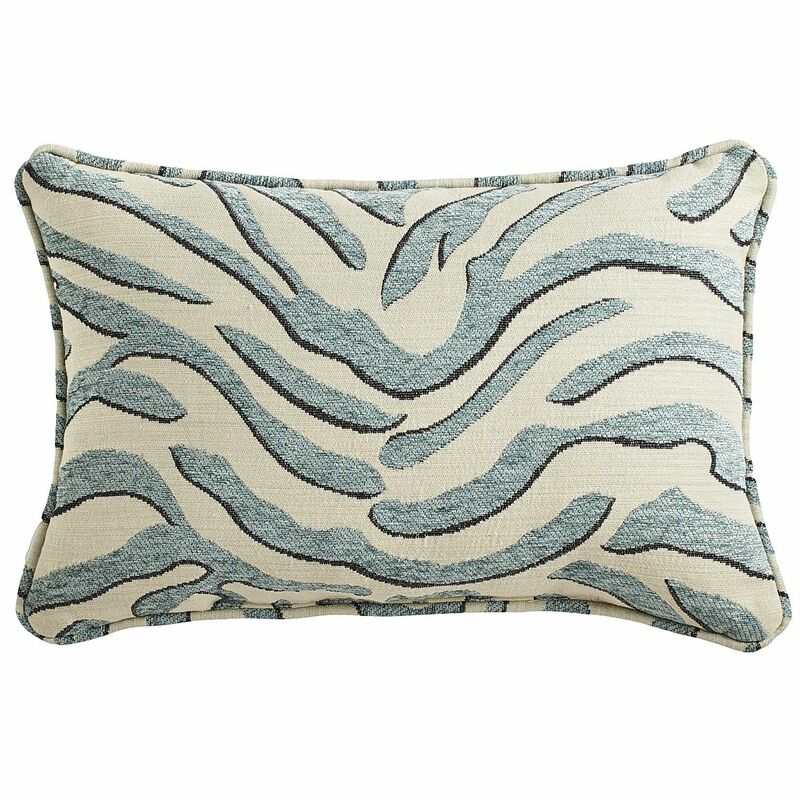 I have my eye on this chenille zebra pillow from Pier 1 (online only). I have also wanted to add some kind of animal print and this may be the ticket! I can center it between the other pillows and get a little more blue in the room! I found the metal tray hidden away in my stockpile and added some decorative glass rocks to finish it off. I took this picture with my cell phone and it depicts the color of the candles better. They seem to be coming up a brighter blue in my other pictures. There is a hint of green in them which is why I thought they'd work well with the other colors I have in the room. I am the proud owner of the book "House Proud" that Ron over at the "The Uptown Acorn" was featured in. Here is a link to his "blog" and also a link to the post that featured the day they came and took pictures for the book "here"
I also have to thank Linda from Life and Linda who sent me the book as a birthday gift. After I got it I was fortunate enough to have him sign my book for me and I love it even more because of it! Thank you again Ron- such a sweet man! Some of you who follow me may have noticed this etagere unit that I've anchored in the corner. Dear hubby and I went out on our anniversary and he bought this for me. It was a real leap for me since it's made with a rusted, chippy metal finish- I was looking for something unique and I think I got it! On the bottom I've set a "root ball" that I laid some faux greenery underneath to give it a little more pop. The deco balls are from Pier 1. I love these- they may end up in that metal bowl one of these days on the coffee table. I didn't really want to compete with the pattern in the bowl, but for now this will do. This ceramic jar and the piece above have the same pattern. I liked them because they offered a little more of a contemporary look and I thought they looked good with the design of this etagere. This unit is made up of 4 cubes which actually fit into each other. Very convenient for moving and storing! It fit in my Malibu car very easily which came in handy! I was trying to find something to add to this shelf so I added my little spaniel dogs and the books add some more blue! That's the book my husband's sister was featured in that I posted about "here" We ended up with two of them, one signed by her that she gifted to us and the other we had purchased. That's a candle votive from One King's Lane that I've had for a while. The scent is so yummy! My son and his wife were living in Pennsylvania and there is a store called Wendell August that sells hand crafted metal pieces. My Dad came from "copper country" in the U.P. of Michigan where his Dad and Grandfather mined copper so Ryan and Angela selected this piece for us knowing the family history. On the top of the chest I used a clear vase to display this potpourri (that had been in a painted metal cache pot but you could only see the top of the potpourri) and I thought the clear glass would lend a little more contemporary element to the room too. I got it at T.J.Maxx for $9.99 and the ones that Pottery Barn sell are $39 and $49! The bottom of mine isn't as thick as theirs but the overall appearance comes across the same. I've set some decorating and gardening books out to encourage looking through them. I'm really pleased with this room arrangement. I need something to go on the wall under the big picture but haven't figured it out yet. I have an upholstered bench that's in the guest bedroom I could steal away, but then I'd loose it's function that it is providing in the guest room. Always something isn't there! The two green chairs that go with the "game table" are relocated in the house. I always felt I had to keep them all together as a set, but when it finally hit me to use the table as an accent I was thrilled. I just noticed one of my cats got in the picture too! Notice the big basket under the table. I picked that up at my first time ever visiting a Pottery Barn outlet. It was the only one at the store and I had actually picked it out in their catalog months before. Hubby liked it a lot so it was sold. Gosh if you've ever been to one of their outlets you know how tempting it is to go hog wild in there! I was impressed with the fact that a lot of current items are in the outlet store. Liz, all of your changes look great! How awesome that you got Ron to sign a copy of your book. Isn't it fun to know other bloggers? Love your etagere, too...the finish is beautiful. I like your changes. It is a nice big room, to work with and I love the blue for summer. xoxo Kitties are so funny. I took a photo of the our elusive female, and while she was posing, the male kitties kept jumping in from the sides. Hi Liz, love the rearrange and all the great details in your room. Love the etagere in the corner and the patina on it is perfect. Congrats on your anniversary and how wonderful to have a signed book too. Love the touch of blue!! Your front room is beautiful and so well thought out. I love your grandfather clock! All your special touches and all the love you put into the room, really make it shine. Your home is gorgeous. I love your style. You have done a beautiful job decorating. I am your newest follower. Liz- The room looks really nice! You have such lovely things so it is fun to see them used in different ways. The game table at the end of the sofa makes a lot of sense. LOVE that basket. I have never been to one of the PB outlets. I don't even know where our nearest one is. Lovely changes Liz. I know you like to move your furniture around. Love the addition of blues and that zebra pillow is lovely. I am glad you love the book I sent you. Ron was so gracious to sign it. Enjoy. No wonder you're feeling rundown and sick, Liz! Look at all this work you've been doing!!! My goodness, woman...you buzz like a bee around your house!! But the results are undeniably worth it! It's so cool that you got your book signed by a contributor! When Ron becomes "Martha Stewart famous", that's going to be worth a ton of dough!!! :-) I know it's already worth a bunch in your heart! Beautiful, darling! Now kick back, put your little tootsies up, and enjoy it! beautiful changes! The room looks wonderful. Love the blue touches! When It Rains It Pours- Right?